Can the Theatre Cap Challenge Solve Patient Safety? Rob Hackett has a story he loves to tell: There’s this gynecologist performing a routine minimally invasive surgery, when he inadvertently cuts a hole in his patient’s bowel. Needing help in correcting the mistake, the gynecologist calls for a colorectal surgeon to join him in the operating room. A young man nearby hustles to sterilize and swings through the OR doors. For the next 10 minutes, the pair works together to locate the hole. Once they’ve found it, the gynecologist turns to his colleague and asks him to map out next steps for repairing it. That’s when the gynecologist discovers that he’s made another huge mistake: He wasn’t working with a colorectal surgeon, but with a medical student who had no experience in such a procedure. Besides this anecdotal story, Hackett—an anesthetist based in Sydney, Australia—has so many reasons to rally against medical error that he’s uncertain of where to begin. In an interview with MD Magazine, he rattled off a series of influential events in his 25 years as a health care provider that stoked his passion and motivated him to try to make a change: the loss of a friend to improper care, a colleague driven to suicide by the high expectations of her profession, the brushback he’s received from superiors in response to his plans for change, and sympathy from other health care influencers who share his ideals. These moments are what convinced Hackett that fixing medical errors is both necessary and possible. But what could he—one surgeon in a sea of thousands—do to make it happen? For Hackett, it started with one simple object: a Sharpie marker. He began to write his name and title on his surgical caps. It was a small idea with big implications—it could simultaneously help him improve communication with his peers and patients, and it was innocuous enough that the hospital board probably wouldn’t waste their time trying to stop him from doing it. Many of Hackett’s peers began realizing the value of the exercise, and joined in its practice. Before long, the #TheatreCapChallenge and the renegade mentality it came to symbolize were spreading to hospitals across the globe. On the other hand, many of his colleagues have given him grief for spurring the movement. Hackett’s received a mixed bag of ridicule and support since he started it in 2017, and when he began posting about it on social media, it was more of the same criticism. Continuity of teams clearly a good idea. Hardly rocket science? Hackett’s efforts to promote the idea on social media created a serendipitous connection with Alison Brindle, a third-year medical midwife student at the University of Central Lancashire in Preston, England. She shared Hackett’s frustration with provider miscommunication during crucial procedures. As a student observer, she was accidentally handed equipment from physicians who mistook her for someone else several times, she said. And like Hackett, Brindle’s patience reached a boiling point. She wrote her name and role on a surgical cap on an impulse one day, and walked into an operating room to a few mixed reactions. But regardless of others’ opinions, the name tag served its purpose, she said. The mistaken identity mishaps ceased, and colleagues began to recognize her around the hospital. 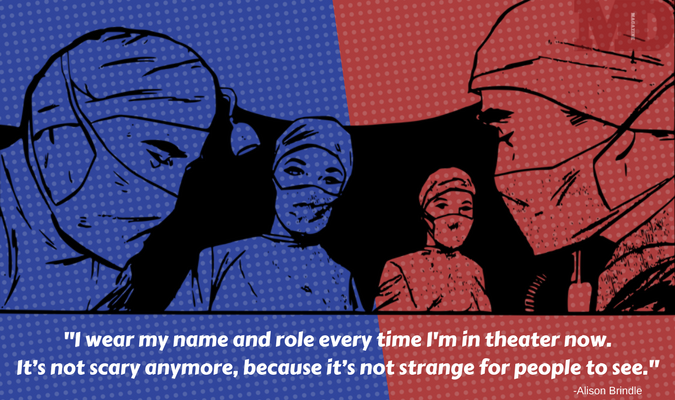 When Brindle began sharing her success stories on Twitter under the hashtag #TheatreCapChallenge, she was surprised to learn an Australian anesthetist was already on top of it. “Initially I hadn't seen Rob’s work on social media, I was only aware of Rob and his passion for patient safety and being identifiable in theatre after I launched the hashtag. Then, he started using it and promoting it. It’s amazing how it has grown from there,” Brindle told MD Magazine. Like many notable movements of late, the theatre cap challenge has thrived on social media. When Hackett came across the hashtag on twitter, he reached out to his brother-in-law, Ant Medler, a creative director in advertising. The 2 had discussed the potential of the campaign before; now that it was catching traction in a whole other continent, they pushed marketing efforts into overdrive. Medler helped Hackett create informative videos on the issue, and Hackett began frequently covering the campaign on his website dedicated to patient safety solutions. Hackett penned a ‘thank you’ letter to Brindle, calling the #TheatreCapChallenge a win-win situation that was achieving its mission of improving patient safety. He also conceded that he likely hadn’t been the first to think up the idea of writing names and titles on surgical caps. Rather, he was responsible for amplifying it. Most followers are fellow advocates, who celebrate Brindle or Hackett’s efforts and include pictures of their Sharpie-stained or embroidered hats in their own posts. Others are embroidery merchants capitalizing on the movement with advertisements for customizable surgical hat designs. And still, some are dissenters challenging the movement with a big question: where’s the benefit? The population of professionals who have pushed back against the movement generally fall into 2 different camps: those who mock the imagery of providers adding a nametag to their forehead, and those who challenge its proven value in patient safety. The former group is one that Brindle and Hackett have been handling since baseline. Brindle described having to be brave enough to enter an operating room wearing her scribbled-on cap for the first time, knowing it might ruffle some feathers. However, at least one Australian-based clinician and journal editor suggested the movement is driven by provider egos, and there is still a population of challengers questioning whether the movement carries a viable value proposition for patient safety. When are we going to see some research into why the #TheatreCapChallenge doesn't affect #patientsafety? I'm all for better communication but is this really the answer? And is it really about patient safety or more to do with posting selfies? That question might soon be answered. This week, the Newcastle upon Tyne Hospitals NHS Foundation Trust in England announced a benefits-based study of care providers who bear their first name on their surgical caps during cardiology-based procedures. Noting Hackett’s work, the foundation intends to provide pre-trial staff questionnaires at the end of April 2018. The trial will run for 8 weeks starting mid-May, with another 2 weeks reserved post-trial to review data before presenting it. Hackett has another story, but this one’s not as easy for him to tell. In a video on his patient safety site, he recalls what he said was the most stressful event of his life. About a decade ago, he was a junior analyst called to aid in a cardiac arrest case in surgery. When he got there, another anesthetist was completing cardiac compressions when things took a turn for the worse. The patient was suffering from an air embolism — a rare instance of air entering the heart through the blood. The patient was a friend to the hospital, the daughter of a surgical nurse who Hackett’s colleague knew since she was a child. She was now in her 30s, and a recent mother who had given birth 3 months prior via a complicated caesarean procedure that resulted in severe bleeding and kidney failure. She was having a vascath central venous catheter inserted the day of her cardiac arrest — which trigged the embolism, and eventually killed her. This amalgamation of failed communication, amplified by the death of a friendly face, is what first set Hackett off looking for ways to improve what he understood to be a broken system. Still, a global-reaching campaign suggests that there’s an opportunity for real change, and a driven workforce who could make it happen. Hackett patiently watches as it grow every day, waiting for the moment that science supports its merit, healthcare leaders sing its praise, and people finally wonder why they hadn’t been doing something so simple all along. And that’s when he’ll share the next idea.